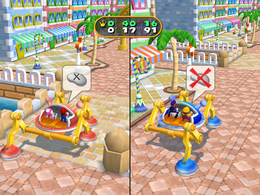 Hop-O-Matic 4000 is a 2-vs.-2 minigame in Mario Party 7 and the name of the machine used in that minigame. The goal of the game is to move the Hop-O-Matic 4000 to the finish line by pressing the buttons that appear on-screen. The players on each team alternate pressing buttons. If one player makes a mistake, the team is slowed down. It takes precisely six hops to get to the finish line (excluding the one that is done in the opening cinematic). The first team to make it there wins. Rules – "Move the Hop-O-Matic 4000 by pressing the buttons that appear on-screen." Advice – "You and your partner will alternate pressing buttons. Teamwork is vial for success!" This page was last edited on May 22, 2017, at 04:44.